If you’re in the market for a “green” car, you’ve plenty of choices to choose from. There are hybrid cars, those that combine regular fuel and electric char and completely electric, like the famous Tesla, some versions of the Toyota Prius or the Chevy Bolt. While they are a step forward in terms of helping the environment, they have some drawbacks, such as the fact that you still need to charge them at night in your home or at a charging station during the day. Sure, the solar panels installed in our home can provide sufficient power to keep them going, but what if those panels could actually go on the vehicle and power it? There are college and high school competitions with concept cars that use solar panels as energy source, but the designs are clunky or definitely ugly. Movement and power take precedent over aesthetics, and they’re usually painfully slow and not road ready. Another problem with solar panels on vehicles is that they don’t generate enough electricity to do much of anything. Toyota already had an option for a solar roof on the previous PHEV Prius, but it was only generating 50 W and powering the fans for the AC. But Kia Motors and Hyundai Motor are trying to change that. 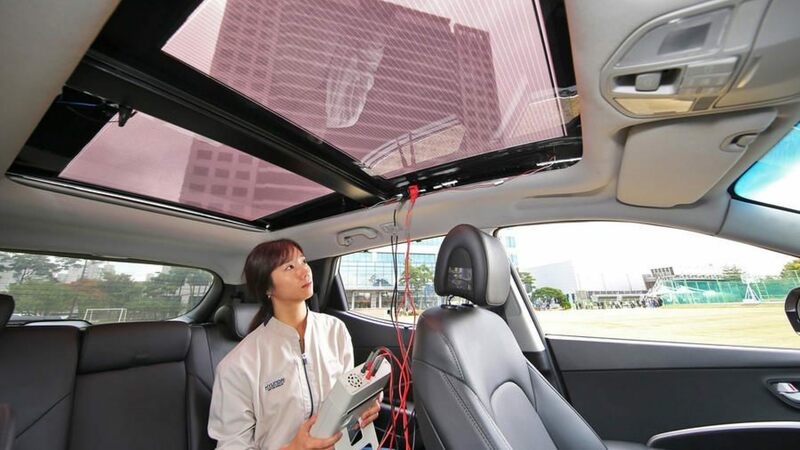 in late 2018, the Korean automakers announced plans to introduce ‘solar roof’ charging technology on selected Hyundai Motor Group vehicles. Electricity-generating solar panels will be incorporated into the roof or the hood of vehicles, and will support internal combustion, hybrid and battery electric vehicles with additional electrical power, increasing fuel efficiency and range. The solar charging technology is being developed to support the vehicle’s main power source, improving mileage and reducing CO2emissions. The system will have the capability to charge the batteries of eco-friendly electric and hybrid vehicles, as well as those of internal combustion engine (ICE) vehicles, helping to improve fuel efficiency. Hyundai Motor will launch the first generation of this technology into its vehicles after 2019 to help meet global regulations targets and improve vehicle fuel efficiency. Kia Motors will also announce plans to apply the technology to its vehicles in the near future. While you wait for these cars, you might want to prepare your home for the energy they’ll need. Remember, the solar panels on these vehicles will still not provide all the power they need, so a solar system installed on your roof will still be needed. And with the cost of solar panels dropping in recent years, there is no better time to take advantage of incentives and rebates and join the solar power revolution. Want to learn more about the amazing benefits of going solar? Check out the HahaSmart blog!